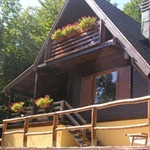 If you want to live a week in contact with nature, recover energy ... Give yourself an unforgettable holiday in Baita !!! Book your holiday at Tana dell'Istrice for a holiday full of adventure between horseback riding, trekking, good cooking, trekking on the trees, nature trails and very high ..
A DREAM CHALET FOR YOU! YOUR HOLIDAY IN MOUNTAINS! The Tana dell’Istrice is situated in the heart of the Apennines of Pistoia, in the Sestaione valley, between Cutigliano and Abetone at 900 m above sea level. The establishment is made up of 12 newly constructed apartments with independent entrances and spacious terraces. The apartments, surrounded by wonderful woods of chestnuts and tall beeches, have a magnificent view of the whole crest of the Tuscan- Emilian Apennines. 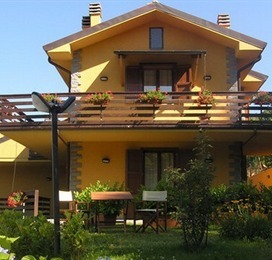 Tana dell’Istrice is the ideal place for whoever loves living in contact with nature! The Baita Belvedere is a typical mountain hut made ​​of wood ... flooring, furniture, kitchen ..
walls ... perfect for lovers to spend a dream vacation and relaxation in nature! ..
A green park with barbecue, tables and fountain, and a SWIMMING POOL with a panoramic view, heated by solar panels for customers of the structure Tana dell'istrice. It is situated in an excellent position for reaching the Tuscan cities of art. 70km from FLORENCE, 101 km from PISA, 78 km from LUCCA, 37 km from PISTOIA, 55 km from PRATO.